Smith State Prison is located in Glennville Georgia, part of Tattnall county. It is a closed custody facility that is capable of incarcerating approximately 1,615 adult males. 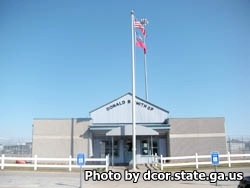 Many of the offenders at this facility exhibited behavior that was difficult to manage or address at other facilities, so they have been moved to Smith State Prison where they can be properly controlled. Inmates are housed in either an open dormitory with double bunk beds, triple offender cells, double offender cells. Inmates at Smith State Prison can earn a GED, adult basic education and take literacy courses. Offenders can also work within the correctional industries program creating custom signs, get A+ certification, learn building and industrial maintenance, landscaping, culinary arts, clerical skills, bee keeping, computer repair, and electrical systems. Worship/prayer services and bible study is offered through the Chaplains office. Visiting for general population inmates is 9am-3pm on Saturdays, Sundays and State recognized Holidays. For Tier inmates you need to contact the institution.